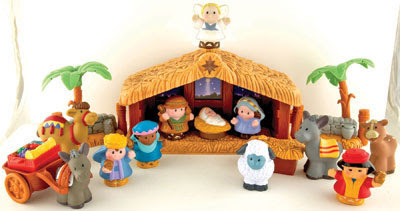 This year I gave in and bought the Little People Nativity. It was worth every penny. I can finally rest easy knowing my breakable nativities are safe now that my children have their own to play with. It has been the favorite toy all month long. It's pretty much all they play with. Of course I wasn't willing to fork over the ridiculous $40-$50 they usually cost. With a little bit of searching I found one at a decent price. All month long Family Christian Stores have had them on sale for $30. If you do a search for "Family Christian Stores Coupon" you're sure to find a coupon for 25% off bringing your total to just over $20. Not bad. Wow, that is a great Nativity! I love Little People toys. I was so sad to find out they are out of the Nativity! I even considered sending my friend in Boise on a hunt for one at a store near her, but they are out too. Maybe next time!